The Kodiq is the most expensive vehicle that Skoda has ever launched in India. But is this 7-seater SUV capable enough to hold its own against established offerings from Toyota and Ford? The recently launched Skoda Kodiaq is the first full-sized SUV from the Czech-based carmaker. Based on the VW Group’s MQB architecture, it is a sophisticated, fully loaded European SUV that lives in a class of its own. However, at Rs. 34.49 lakh (ex-showroom), it is inevitable not to pit this new Skoda against big guns like the Toyota Fortuner and Ford Endeavour. So, let's find out how it fares against its biggest rivals in India. The Kodiaq is a completely different take on an SUV as compared to the other two. It is shorter and much lower, but also wider. This gives the Kodiaq a striking, more urbane presence versus Fortuner and Endeavour, which are designed to look tough and intimidating. The Kodiaq’s design, with that large butterfly grille, is unmistakably Skoda, the company has also added enough elements to make a vehicle of this size look sharp. Volkswagen Group vehicles always feature outstanding build quality, and the Kodiaq is no different. On the design front, it’s cabin features clean and contemporary lines with top-notch materials. And given the fact that the Kodiaq is only available in one variant, it comes loaded to the brim. Features like three-zone climate control, touchscreen infotainment with Apple CarPlay and Android Auto, electric front seats with memory function, panoramic sunroof, all-around parking sensors with reversing camera, 10 colour interior ambient lighting, etc. are all standard. The Endeavour is also well built, and its cabin sports light colours that grant it an airy feel. Equipment list on the top-end Endeavour is qute expansive, but falls a bit short in front of the Kodiaq. The Fortuner has a busy dashboard design, which resembles that of the Innova quite a bit. Quality and equipment levels, however, are good. All of these SUVs have seven seats, but one of them boast a particularly spacious third row. This is an area where the Fortuner caters to the widest customer spectrum. It is the only SUV here to come with a petrol engine option, and both the petrol and diesel motors can be paired with an automatic transmission. The diesel also gets a 4x4 in both manual and automatic avatars. The Ford Endeavour, at launch, was offered with a manual transmission, however, the option was discontinued in mid-2017. Now, this brawny Ford is only available as an automatic, which can be paired with two diesel engines - either a 2.2-litre or a 3.2-litre. The option of 4WD can be only had with the bigger engine. Skoda’s choice to launch the Kodiaq in just a single spec might limit its customer base. You can have it as a diesel automatic with AWD, that’s it - no manual transmission, no FWD, no petrol engine. The Kodiaq does not get any dedicated off-roading modes either, which the other two have. Also, at least on paper, the most expensive Kodiaq is also the least powerful - it makes 148bhp and 340Nm from its 2.0-litre motor, which is about 50bhp and 130Nm lesser than the 3.2-litre Endeavour. The thing that should be kept in mind is that the Skoda has a monocoque construction, which gives it a weight advantage, and should surely help with its refinement too. The other two SUVs are based on the old-school body-on-frame setup, which gives them better ruggedness, but at the same time, takes away on the refinement front. The all-new Kodiaq, with its single-spec variant, is the priciest car of this lot. It is also dimensionally smaller, and theoretically the least powerful. However, it is aimed towards the kind of buyer who wants a sophisticated European SUV that is well made, and has the best creature comforts for the price. 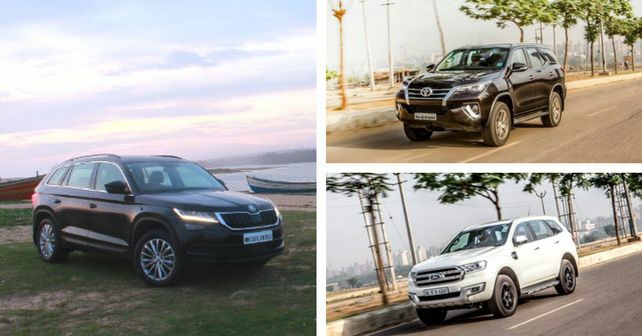 The Kodiaq then, may compete against the Fortuner and Endeavour theoritically, but it is infact quite a different vehicle in nature.